I make additions and corrections to this web site frequently, but because they are buried somewhere on one of the pages the changes are not very noticeable, so I decided to create this blog section to highlight new material. Here below you will find part of one of the pages that I have either recently changed or added to significantly. The section reproduced here is from my page about Birch & Gaydon. Birch & Gaydon 1916 advert for Land & Water wristwatch: Click to enlarge. 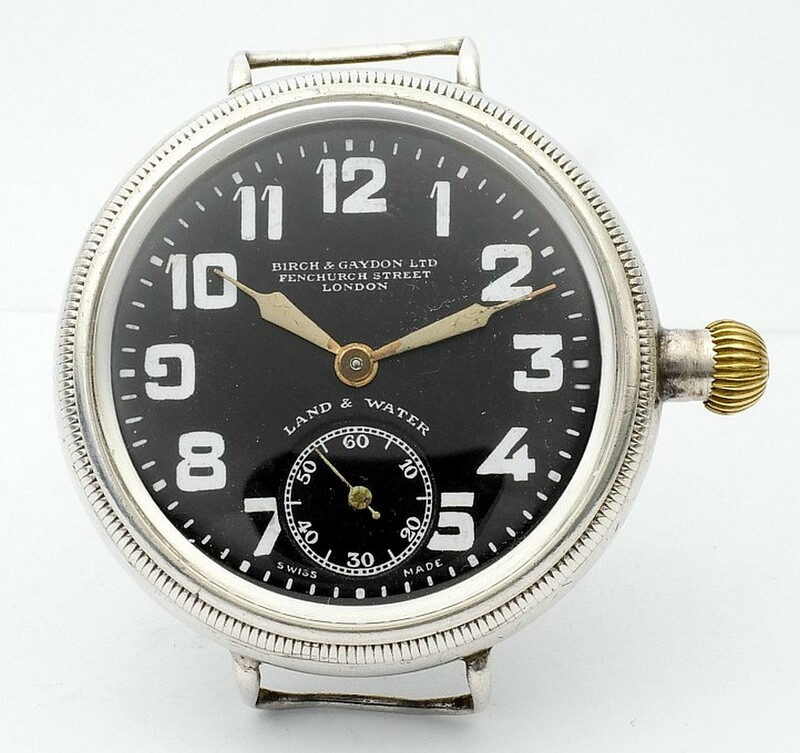 Many Zenith wristwatches were sold during the Great War by Birch & Gaydon under their brand name "Land & Water". The name "Land & Water" appears to have been taken from a patriotic British newspaper of the same name that was founded in 1914 to report on the progress of the war. Land & Water magazine began as a section in the "County Gentleman" magazine. During the Great War this section was spun off as a magazine in its own right and covered the war in great detail. It was edited by the politician and writer Hilaire Belloc. The image here shows an advert by Birch & Gaydon from Land & Water magazine dated 2 November 1916 for a Land & Water wristwatch. This is the earliest advert I have yet found for these watches. The hallmarked cases of these watches don't carry Birch & Gaydon's sponsor's mark of B&G, they were imported by the British branch of the Zenith Watch Co. and carry the sponsor's mark ZWC in a triangle. 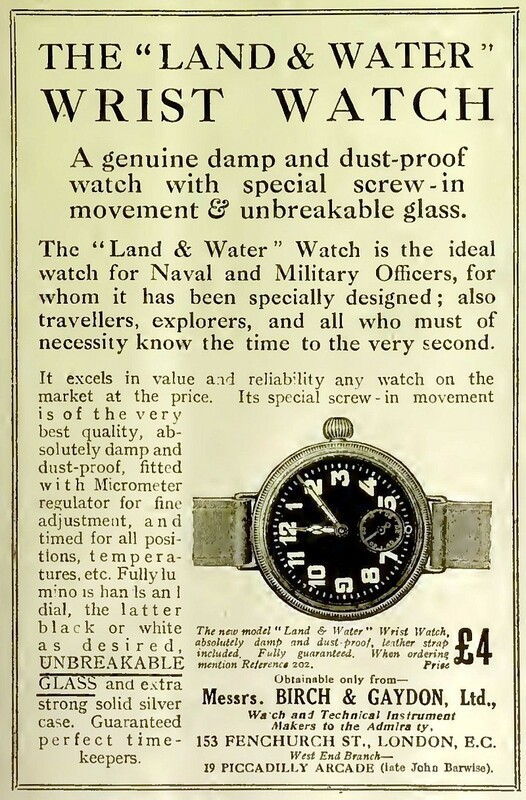 If you click on the advert you should get an enlarged version that is interesting reading, the Land & Water wristwatch is said to be "absolutely damp and dust proof". Type 1: This is the design that I have encountered most frequently. This is sometimes thought to be a Borgel case although it is actually quite different. The advert here says the watch has a "special screw in movement" although the movement doesn't actually screw in. No doubt this was because Borgel cased wristwatches, which do have screw in movements, were selling very well to military men and Birch & Gaydon were trying to appeal to the same market. The front bezel of the Land & Water wristwatch unscrews, and when it is fully unscrewed and lifted away the movement comes with it. Although this is superficially similar to a Borgel case it is actually a quite different design. Type 2: The second design is a more conventional case with a screw back and bezel. These are simple to open, on the back there are usually the words "To unscrew" with an arrow that shows you which way to turn it and a milled edge to grip. It is a normal right hand thread so it is not really difficult to work out which way to turn it if there is no arrow. The front bezel unscrews in exactly the same way. The examples that I have seen of watches with this Type 2 case are smaller than those with the Type 1 case. Both of these different designs of Land & Water wristwatches have Zenith movements. The Land & Water name was an important brand for Birch & Gaydon and they continued to use it after the Great War when the Type 1 and Type 2 designs were created. I have seen a watch marked Birch & Gaydon Land & Water with a Zenith movement in an 18 carat swing ring case manufactured by Dennison. The case has Birmingham Assay Office hallmarks for 1934/35, whereas the Zenith movement serial number dates its manufacture to 1938, and an inscription on the back is dated September 1939. The movement and inscription dates tie together well, but at first sight it seems a long time between 1934/35 and 1938/39 to hold an 18 carat gold case in stock before inserting a newly made Zenith movement. However, since the world was gradually recovering from the great depression this could have happened, so this appears to be a later third type of Land & Water case. The Birch & Gaydon Land & Water wristwatch with a one piece case and screw bezel is quite unusual. The case is sometimes mistaken for the eponymous screw case designed and patented by François Borgel, but it is in fact quite different. To remove the movement from a Land & Water Type 1 case you unscrew the bezel in a similar way to a Borgel screw case, but in this design there is no need to hold the crown and stem out as usual with a Borgel case, because the movement doesn't turn as the bezel is unscrewed. There is a clever concealed joint between the bezel and the movement carrier ring that allows the bezel to rotate while the carrier ring and movement remain in the same position. Once the bezel is unscrewed and free of the threads on the case you can lift it away and the movement comes with it. 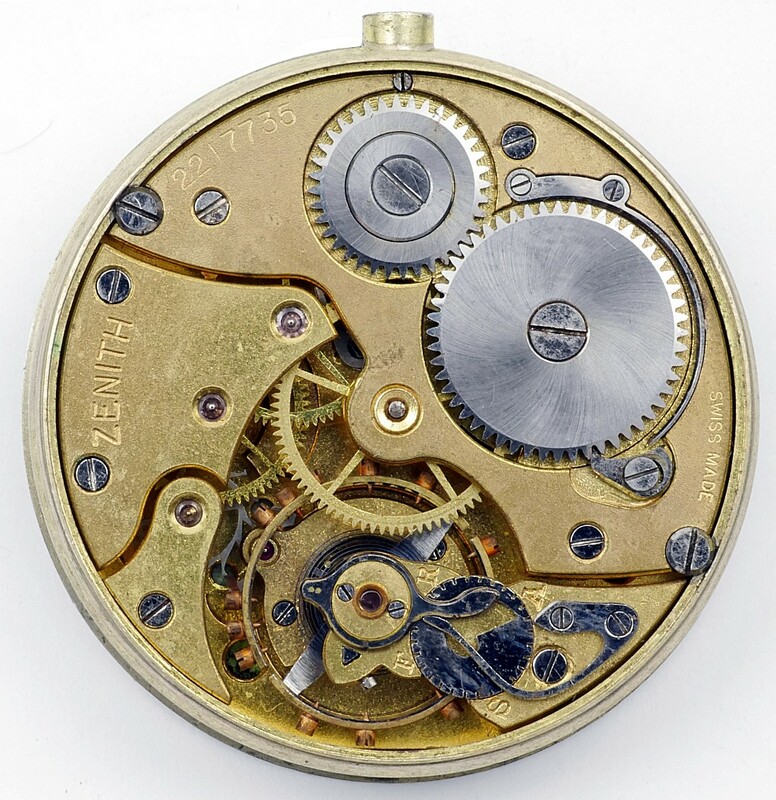 When the assembly is clear of the case you can see that the movement is held in a carrier ring which has a smooth external surface - unlike a Borgel screw case there are no screw threads on the outside of this carrier ring. The bezel and the carrier ring are held together, but the bezel is free to rotate on the carrier ring so that the movement doesn't turn in the case as the bezel is screwed and unscrewed. At first glance this seems to be a bit of a mystery, it is not obvious how the rotating joint is formed. The secret is that the bezel is made in two parts. My drawing of a cross section through a Land & Water case shows the two bezel parts, the lower ring that has an external screw thread which engages with the threads in the case, and the upper ring which carries the glass. The movement carrier ring has a small external flange at its upper end. This flange sits inside a counter bore in the lower part of the bezel. The upper part of the bezel is a press fit into the counter bore in the lower part. This holds it securely in place but it doesn't trap the flange of the movement carrier ring. The two rings that make up the bezel are a marvel of the case maker's art. They are extremely thin and delicate and it it is difficult to imagine how they were made, and especially how the screw thread was formed on the outside of the lower ring. They usually fit together so well that it is difficult not to believe that they are one piece, hence the apparent mystery of how the carrier ring is held. The lower bezel ring has coin edge milling for grip, whereas the upper bezel ring is smooth, you can see this in the photograph of the watch. Once you know this you can gently insert a fine blade into the joint and gently pry them apart, working round as you do so that you don't distort them. Once the two parts of the bezel are separated they can be taken away from the movement carrier ring. The case screws are then removed and the movement and dial can be pushed out of the carrier ring. The movement has "negative set" or "American system" keyless works, so a short "case stem" and the crown are attached to the case. A detent mechanism in the stem tube on the case holds the crown in either the winding or hand setting position. This is shown in the cross sectional drawing above. 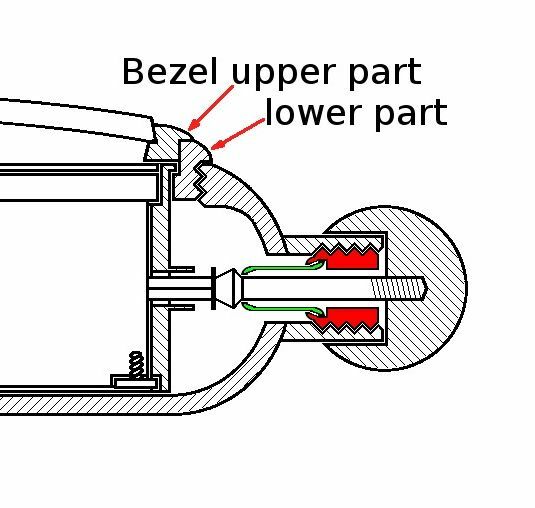 The detent mechanism is formed by a split spring sleeve, coloured green in the drawing, which holds the stem in position axially but allows it to rotate. The drawing shows the case stem held in the normal "winding" position. When the crown is pulled away from the case the fingers of the split sleeve are pushed aside by the tapered swelling on the stem and then grip it again at the waist on the other side of the swelling. A flange stops the stem being pulled out any further. The case stem and its detent sleeve are another masterpiece of the casemaker's art. The picture to the left shows the case stem in place in the case. The picture on the right above shows the case stem and sleeve removed from the case and the picture on the right below shows the stem tube on the side of the case. There are three parts in the stem assembly, the case stem itself, the split sleeve, and an externally threaded hollow plug, coloured red in the cross sectional drawing, which screws into the stem tube and holds the sleeve in place. The sleeve is held axially by the threaded plug but is free to rotate. When it was made the sleeve was fitted into a socket on the end of the plug and the end of the plug swaged over to hold the stem in place. This is different to the arrangement in pocket watches where the plug and sleeve are separate, the sleeve dropping into the pendant onto a shoulder and the plug screwing down to hold it against that shoulder. 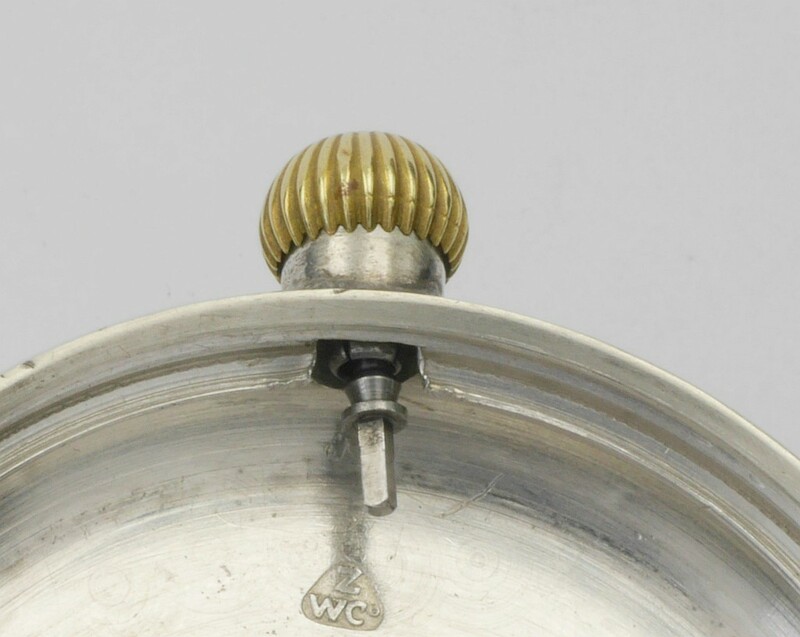 In this wristwatch case the stem tube isn't thick enough to machine a shoulder for the sleeve to sit on, which is why it is attached to the plug. 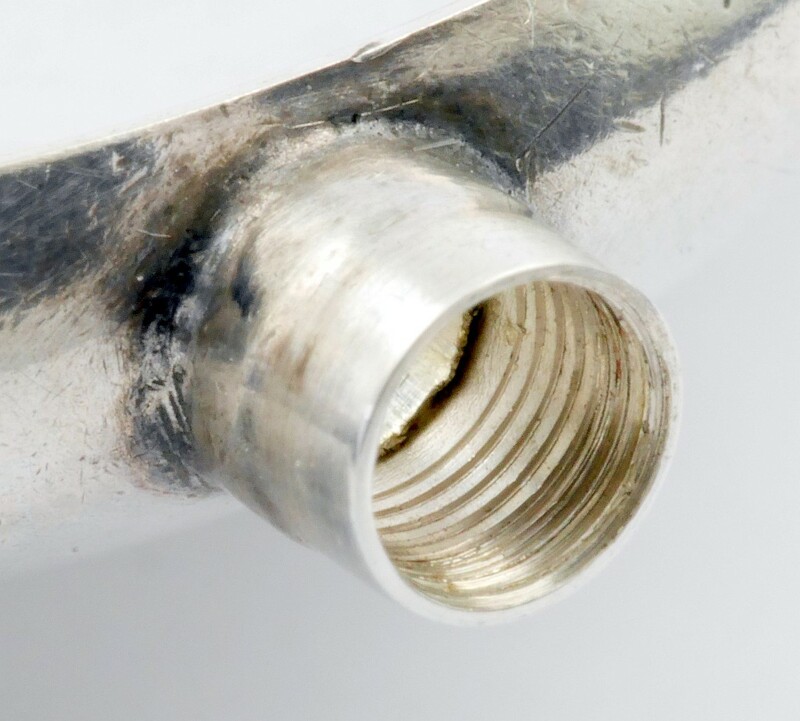 In the picture of the stem tube you can see a small land that is just big enough to screw the plug down on to but not big enough to allow the same arrangement as in a pocket watch. Bearing in mind that the square on the end of the stem is only about 1mm square you can get an idea of how tricky it would be to make one of these. The spring sleeve is made from high carbon steel and was hardened and tempered to make it resiliently springy. The stem itself would also be made from high carbon steel and hardened to reduce wear. They have survived the hundred years since they were made in remarkably good condition and work perfectly. The images below are of the Birch & Gaydon Land & Water wristwatch that the case stem was taken from. These are "as found" pictures before cleaning and restoration. The hands are wrong, they should be poire-squelette shape skeletonised radium luminous hands like the ones shown in the 1916 advert. The Zenith movement has the clever micro regulator mentioned in the 1916 advert. Those with sharp eyes will notice that the click spring appears to be slightly short and not pressing the recoil click correctly, which could cause problems when winding so needs to be sorted. The inside case back case (not shown) has Swiss hallmarks, 925 and a single standing bear, and Glasgow import hallmarks for 1916/1917, the registered sponsor's mark is Zenith's own ZWCO in a triangular shield.